Is Mayor Briley serious about more funding for public housing? NASHVILLE, Tenn. (OSBORNE) -- Nashville Mayor David Briley is reportedly considering using taxpayer dollars to fund improvement to the city’s public housing. 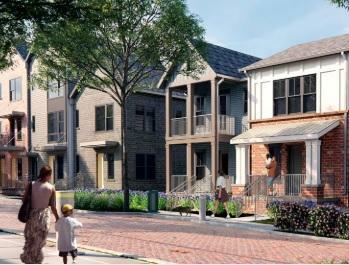 An artists rendering of housing now being built to replace the aging James E. Cayce public housing complex in East Nashville. Last week the Tennessean quoted unnamed sources in the Mayor’s Office saying Briley would go public with the proposal soon. The semi-autonomous Metropolitan Development and Housing Authority traditionally handles public housing construction and maintenance, but MDHA is struggling. Mayor Briley is reportedly suggesting the city chip in millions to help in the coming years, but no official announcement to that effect has been released. A spokesman declined to comment when WMOT asked the Mayor’s Office about the initiative. Metro Council Member Bob Mendes says he was surprised by the Tennessean story. He says for years the council’s been told that MDHA has sufficient funds to cover public housing improvements. Councilman Mendes says if the proposal is more than just a trial balloon, it comes at a difficult time. Revenue is down and budgets are tight. City residents won’t have to wait long to learn if Mayor Briley is serious about putting taxpayer dollars into public housing. The mayor will present his budget to the council the May 1.